I went to Chappy's virtual birthday party and got a gift! I'm sure Deb helped Chappy get it sent out in the mail, and I know that it was Deb who spun up that gorgeous yarn! It's so nice and fine -- I pretty much spin at one thickness, so I greatly admire these finer yarns. My photo does not even capture the beautiful low lights and highlights in this yarn. I have to find a special project for it. Thanks, Deb! After that I'm going straight to the Orchard Corrie -- also from Spunky Eclectic. I'm on a spinning roll! A Gift and a Bug-a-boo! Toni sent me a lovely gift in the mail -- a washcloth made with SWTC Bamboo yarn. Isn't it pretty! And just my colors too. And mostly for her papa's benefit -- here's Mud's new sleeping spot. She's in a bucket cooler (that is currenlty filled with Maddie's outgrown coats) in the corner of the little eating room. Doesn't she look cozy? Some mail arrived while I was gone. . .
First, a word about swaps. I was burned on the the last one I joined. (I feel bad for the swap organizer -- what a drag. She had 8 people that didn't hold up their end of the swap!) So, I was thinking that this was a sign that I should hold off on doing any more swaps for a while -- then the lace swap came along! Knitting Felted Bags -- My "mac & cheese" knitting, comforting and familiar. It's work, but I love to do it. Sock Knitting -- This is my "on-the-go" knitting. I always have a sock project in my little Longaberger basket, ready to go whenever I hit the door. Lace Knitting -- The knitting I do when I have time to knit -- at night or on the weekends when I want to really *enjoy* my knitting. I *love* knitting lace! Okay, so I had to join. And as luck would have it, I was matched up with Jae who showered me with the most excellent gifts! The yarn she chose is a beautiful sage green -- Jagger Spun Zephyr -- I've never used this yarn before, so I'm eager to try it out. It feels lovely! And the pattern is the Baltic Sea Stole by Fiber Trends. 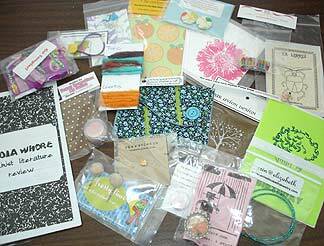 She included some other goodies including something that I have never used, but think is ingenious -- Post-it tape! How come I've never heard of this before? Have I been living under a rock? What a great thing to use to mark your charts. Thanks, Jae!! Another package arrived too. . . It's the rug hook kit I purchase at Michigan Fiber Fest from Linda at Hooked on Ewe. So it looks like I'll be trying a new craft in the coming weeks. I'll let you know how it goes! Not much time for posting today. The new Spring stamps arrived over at my rubber stamps store, which means lots of website updates and orders being packaged up and shipped out. 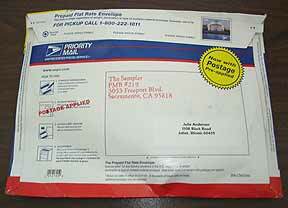 When I returned from the post office I was rewarded with an inconspicuous package sitting on the doorstep. When I opened up the plain white plastic parcel, this was inside! A few of the Kona Cotton colors I wanted were backordered, but there is enough here to start playing. Looks like the quilt might get started next week -- I'm very excited! She thought it was so much fun and has been making valentines with all the crafty bits and pieces packed into the wonderful package! She especially likes the cute little hearts that you see in the front of this last picture. . .
After "school" she filled them up with things from each of the little silver containers ( buttons, foam beads, paper heart, etc. . . ) and set off with her "Valentine purse". Thanks so much Elliot and Paige!! Maddie & I are having lots of fun with the wonderful package and we hope to put together one that you will enjoy too. ** Update ** There is now a flickr group for the Mini Swap. That's not all I received in the mail though. . .
Liz sent a great big box of fiber for Theresa & I to try out! This deserves an entire post all it's own, so I will save it for another day. Thanks so much Liz! And finally. . . the Spring 2006 Interweave Knits arrived. Can't wait to take a look at that later. . . I'm bad. I forgot to alert you to Amy's mail order club. Actually I nearly forgot about it myself! (Upping the meds has my all befuddled again. A side effect that fortunately only lasts a couple of weeks!) I logged on this morning and luckily she had sent out a reminder email to her mailing list -- thank goodness I had the good sense to sign up! I can't wait for the fun mail to arrive!! It feels like Chiristmas. . .
Because good packages keep heading my way! 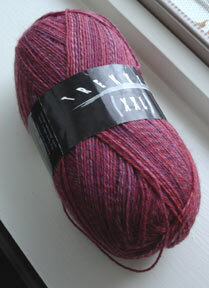 Today I received this gorgeous Trekking sock yarn in colorway 91 from Emy. It is totally my color!! I can't wait to start them! Thanks so much, Emy! Mail -- and it's Koigu! The mail was good to me today. 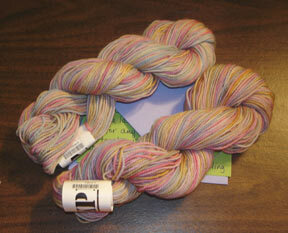 Maria sent me these lovely skeins of Koigu. Thanks, Maria! Man, I need more shelves. Look what arrived in the mail! It's the Sampler that I posted about here. Take a look inside. . .
Lots of cool stuff! From blank cards to hair bands, buttons to lip balm. There is even a sample of some yarn and a tiny fetus(!) too. And the October subscription sign up is today. They go super quick, so head on over and check it out! I got a gift-y in the mail! It's some lovely Endicott Merino from Ashland Bay. Can't wait to spin this up! Thanks Natalie! And in Katrina charity news, Christine at Big Pink Cookie is hosting Knitting for Katrina. Go check it out!